What can I say? 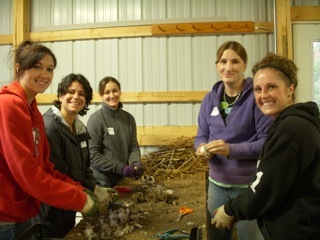 We have just LOVED volunteers helping out at our farm. If there is one thing to learn about farming, it is that there are simply never enough hours in a day to do everything that needs to be done plus those things we would like to do on our farm. 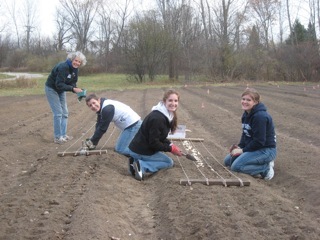 As just a few past examples, we have welcomed the Clinical Nutrition Department from St. Joseph Mercy Hospital in Ann Arbor, a class from Madonna College covering the environment, food, and health, MSU’s Student Food & Nutrition Club, an individual needing to contribute volunteer hours for completion of the Washtenaw Community College Organic Certification, students fulfilling service hours for their high school, undergraduate students from the University of Michigan, many of our garlic customers, many friends, plus many dietetic interns from local programs and around the country. Thank you to ALL! January 2018 Update – We are no longer growing garlic commercially, therefore we anticipate being able to do the routine work on the farm ourselves. We have truly appreciated all past help. Special Note: Being a Registered Dietitian (RD), Diana has welcomed all dietetic students, interns, and educators in the past, however, she regrets that due to slow recovery from a serious injury in 2016, she was unable to host dietetic students and class farm tours in 2017 and forward starting in 2018 also.